It is hard to believe that we are getting ready to go back to school. Where did the summer go, and how can we rewind and get it back? I never feel ready for the hustle and bustle that is about to hit and I also miss the kids when they go back to school. Back to school is stressful for our kids also. They worry and wonder too. It is a big adjustment and anything we can do to ease their minds will help. Here are key things that we can do to make Back to School Better for the whole family. First, here are 2 things just for ME and YOU. 2. Clear OUR schedule the first week of school. 1. Establish a sleeping and eating schedule. 3. Round up the necessary school supplies. 4. Attend back to school night...visit the school. This one is really important. Attend back to school night so your children can meet their teachers, see where they are sitting, and get an overall feel of how things work. While you are there, run through the library, playground, lunch room, meeting places for drop off and pick up and anything else they are curious about. Don't rush, so that your children can ask questions and get answers. They will feel much better if they know what to expect and where to go that first day. At least once, twice if you can, take a practice run. Set the alarms, get up, go through the routine, and drive to school. See how things go and trouble shoot any problems. Maybe you need to move where you put the backpacks, or it takes a little longer to drive to school than you thought. Go through the motions and help your kids understand what has to be done each morning to be on time. If your child is going to ride a bus, practice (drive) the bus route also. Rehearse the drop off and pick up locations, and drive the route so kids know how things are going to work. 6. Find out who else is in your child's class. Take some time before school starts to get the house ready. Designate a Drop Zone. This is a place for backpacks, coats, school papers, etc... All the things that kids like to drop on the floor right inside the door when they come home from school. Kids are much more likely to help keep things clean and organized if they know where things belong. Having a place for these everyday articles will make school go much smoother. It will make finding everything in the morning much easier and less stressful, and it will keep you from feeling like the new school year has taken over your house. A little preparation will go a long ways. 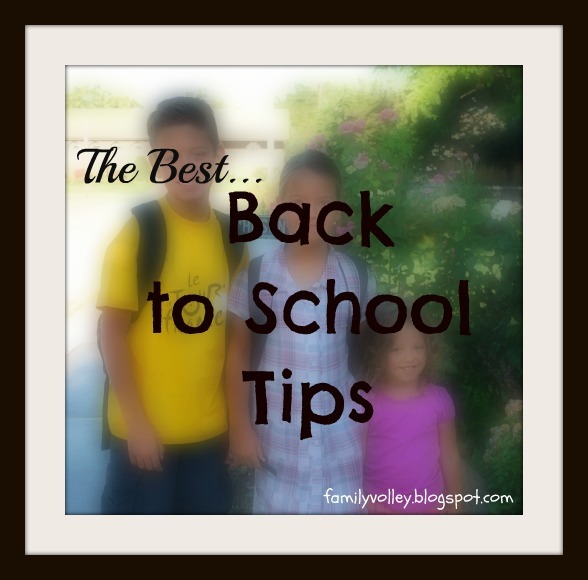 Preparing ourselves, our families and our homes will make going Back to School a good experience for everyone. Great reminders, Heather! My kids start tomorrow and we are almost ready. I really like the reminder to clear the schedule. The transition is always harder than I remember. So true. That transition wipes our kids out. They get so excited/nervous, that the first week can take it's toll. Hope all is going well. So I think this is the first time I've read one of your posts and thought "I'm totally on the ball." Today was the first day of school. I didn't cry in front of my kindergartener, even though I wanted to. We had school supplies labeled and ready two weeks ago. We looked at class lists last week and discovered that all of their friends are in other classes (bummer) but I told them it's a great opportunity to make new ones! I was up early this morning so I was ready so I could help them be ready without rushing; we got to school early; I was there to pick them up early; I had fresh baked cookies waiting at home and we talked for a good twenty minutes about the day! 3rd grader report: it was AWESOME. Kindergarten report: it was very long. All day kindergarten is going to be an adjustment. Emily, woo hoo! What a great start to the school year you have had. Way to go mama! Thanks for the invite Susan, I added it to the party. Happy Back to School! Love the tips! My oldest is starting kindergarten tomorrow ... time sure does fly! Tara, Hope your little one loves school!